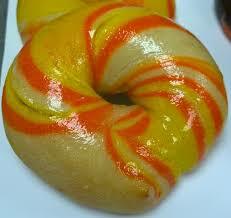 But a candy corn bagel? Yes, that is the super-shiny, garishly colored baked product on the left. It’s sold, of course, at a bakery in my beloved adopted hometown of New York City. Now, I love a theme, but this bagel just looks wrong to me. But before I pass judgment, I wanted to get your thoughts. This entry was posted in Commentary, Food, Holiday, Humor, Life, Restaurants and tagged bagels, baked product, bakery, bread, candy corn, commentary, food, garish, Halloween, holidays, Humor, judgment, life, New York City, poll, restaurants, theme, tis the season. Bookmark the permalink.